Um. I’m a bit late with this post, aren’t I? I did finish the Estes Vest, although I was too optimistic about finishing it all on Tuesday night. I was still doing that i-cord trim well into Wednesday night. I went out and took pictures on Thursday, sans buttons. All finished! Ignore the incredibly dorky look on my face- I’m looking into the sun and aren’t sure when the shutter was going to go. (Sun in eyes + small flashing red light = no idea what the camera is doing.) I really love the contrasting trim, even though (as Lowell can verify) I was really regretting my choice when I started. The trim is curling pretty aggressively at the bottom/corners. I’m hoping that another blocking will help that (in real water this time, not steam!) I know that I can’t make the curl go away completely, but I hope I can to lessen it. I just have to find some good buttons for it now. I know I said I’d like to make the buttons, but I tried that on Thursday and nothing I made seemed, well, any good. Which seems to describe the whole last week, truth be told. Step 2: Pick stitch pattern. Step 3: Knit until yarn runs out. So, I picked the yarn. I picked a stitch pattern. And I started to knit. For about three inches. Then I decided that the pattern wasn’t really… good. So, pick new stitch pattern. Knit three inches. Look critically at pattern. Frog. Pick new stitch pattern. Knit three inches. Look critically at pattern. Frog. Throw yarn across room to impress upon it the importance of listening to the artist. Take a deep breath and try again. And again. And again. 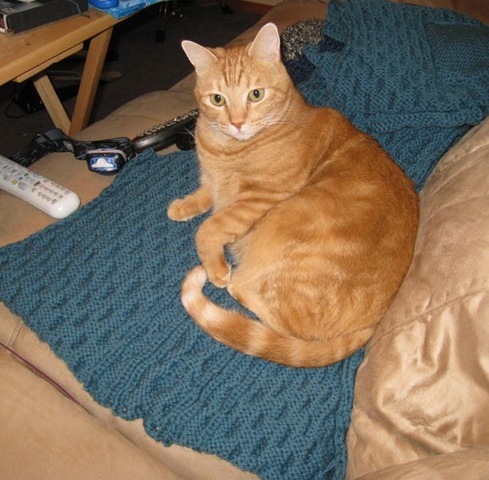 I’ve been knitting for days… and I have nothing to show for it! I’ve frogged everything I’ve done so far. This scarf is seriously starting to weigh me down. I really should have taken a picture of all the various attempts at scarfage, but I was far too annoyed at having to frog again to pull out the camera and go up to the light box. 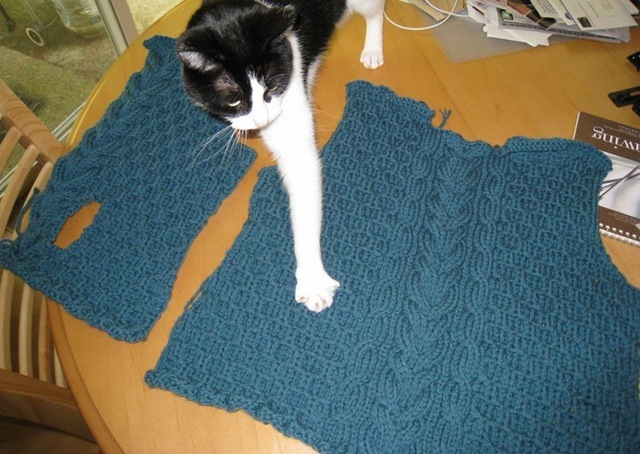 I kept saying, once I figure out this pattern, I’ll post about the scarf on my blog. Of course, I still haven’t gotten it figured out. But, I think I’m finally getting closer. I’m at least running out of stitches to try. Stupid scarf. No, the vest isn’t done yet. I still have to do the i-cord trims. Hopefully I’ll finish those tonight and make the toggles for the front tomorrow. My cat, Arwen, has developed quite the fondness for this vest. She likes to snuggle on it, wherever it is. My lap is irresistible when the vest is on it. I left the vest in the middle of the couch the other night, where the cats don’t like to sleep even when we’re sitting on the couch. She spent the whole night asleep on the vest! I think she likes the wool smell, because she won’t sleep on that spot if we put one of my crocheted blankets in that spot. I can try the vest on, though I haven’t taken pictures of it. It’s very warm and heavier than I thought it would be. But considering that it’s about 900 yards of bulky yarn, I really should have expected it to be heavy. The pockets are a little small (I can’t fit my whole hand in one) but that’s ok. I’m excited to be able to wear it around town. However, I made some discoveries while working on this project. I’d rather graft than seam. Picking up stitches on an unslipped edge is tortuous. 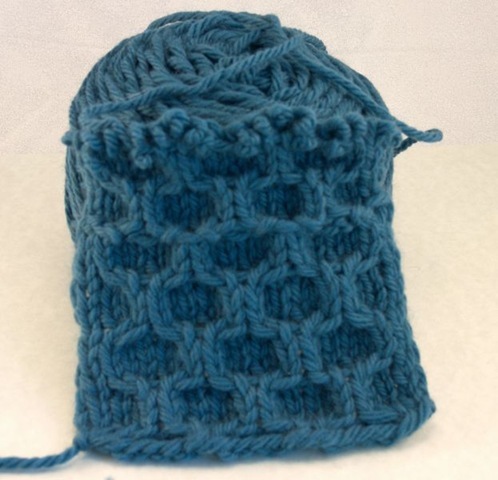 What the heck do you do when you pick up a stitch in each row, but don’t end up with enough? Just because a project only has 1 color of yarn, that doesn’t mean you won’t spend hours weaving in ends. I’d rather work a Fair Isle with 12 colors where each color is used for only 1 row than seam. Steam blocking may be faster, but isn’t sufficient for a big project. Did I mention the slipped stitches issue? Seaming along two cast off edges- what’s up with that? I’d rather knit with the worst, cheapest acrylic blindfolded with my feet than seam. I haven’t done it yet, but I have a feeling I’ll learn that I don’t like applied i-cords either. Pictures when everything is finally finished! Probably Thursday. 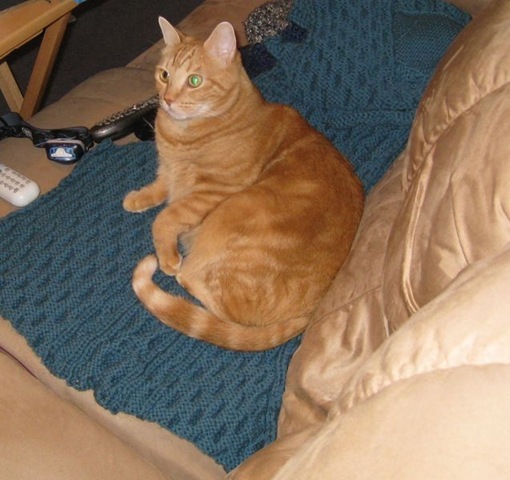 Knitting time is limited by cat naps. 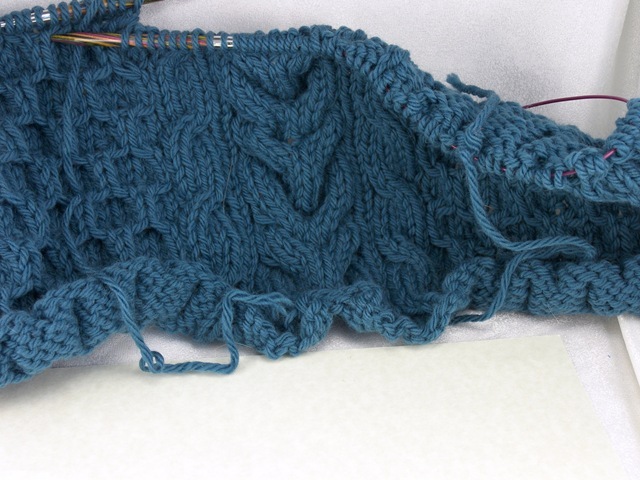 Has someone ever told you that slipping the first stitch of a row makes seaming easier? I found this out the hard way, when I started thinking about my first seaming and how I wanted to do it. I realized that I had slipped the first stitch of every row, more out of habit than anything else. I mean, check out this list of patterns; I am clearly sock obsessed and the only time you knit back and forth for a sock, you’re slipping stitches left and right. Unfortunately, you can’t really seam slipped stitches very well. Mattress stitch could work; I’d just have to seam two stitches in instead of one, but since this is a bulky yarn project, that would eat up a good amount of space. And there’s all the shaping next to the selvedge stitch. I can’t use the slipped stitches for the mattress stitch because there’s only one stitch for every two rows. You can imagine how annoyed and scared I was. 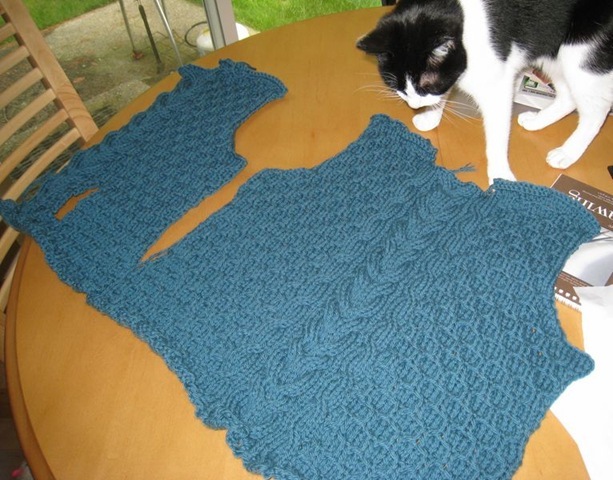 Had I knit the back of the vest (almost perfectly, may I add) only to fail on the sewing?! Would I have to reknit the entire back?! The horror. 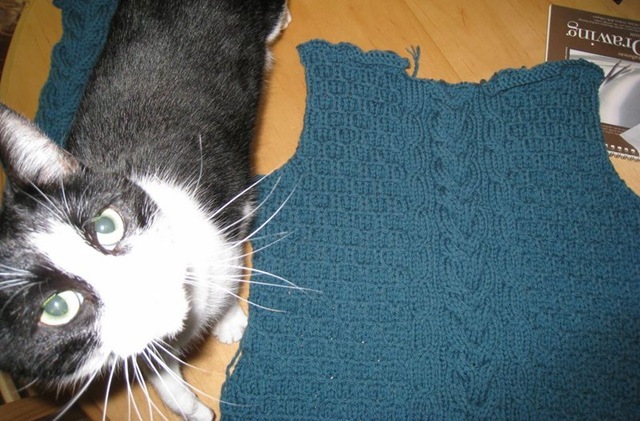 Well, it turns out that I have a few options and my panicking and pathetic post on Ravelry was likely unnecessary. First option, the three needle bind off. Basically, instead of grabbing a needle and yarn, I’ll pick up a stitch in each slipped stitch for both pieces. Then I’ll do the three needle bind off on the wrong side and hopefully, voila! Or there’s this crochet hook magic which is a bit like picking up dropped stitches, only with side seams instead. I tried that out on a swatch and it looked okay. That one I could do on the right side or the wrong side, thus adding my own “design element,” let’s call it. Needless to say, I’ll never make this mistake again. Slipped stitches are for sock heels, edges on scarves, and mosaic patterns, but not sewing edges! If anyone else has some suggestions about seaming slipped stitches, I’d love to hear them. I worked on the Estes Vest for a while last night and I’m now halfway between the waist decreases and increases. 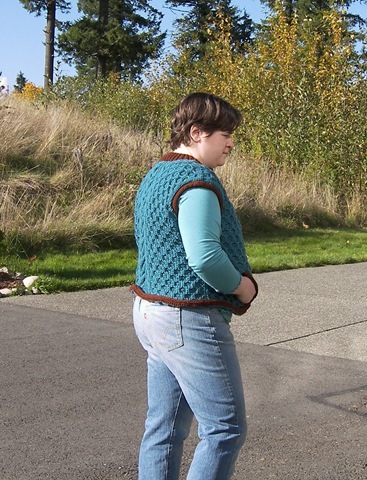 I knit a few more rows (7 to be exact) before starting the waist shaping because I wanted the vest just a tad longer. 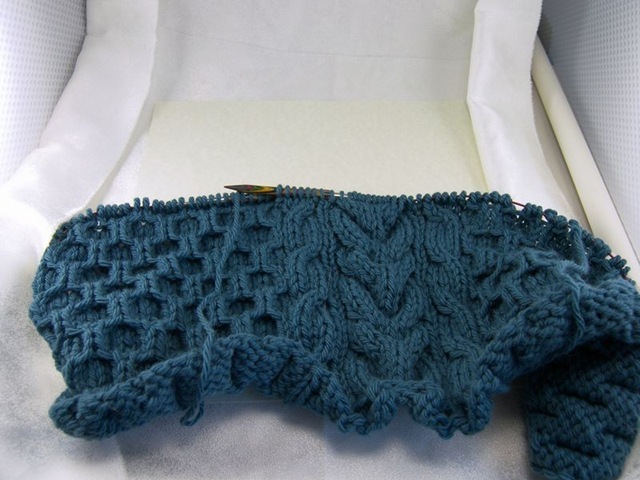 I’m really enjoying the project so far… but that could be because it knits up so much faster than sock yarn! If you’ve got the pattern yourself, you might notice that I accidentally reversed the cable twists on either side of the stag cable. But if that’s the worst “mistake” I make, I’ll be very, very happy! As you can see, I’m using the snazzy Knit Picks Harmony Needles. These are the interchangable ones, which I love. I used to use the metal ones, but apparently, my hands eat nickel needles. I swear! I bought an Addi Turbo circular needle last year and look what happened to it after one project. Those tarnished areas are not only ugly but they keep the yarn from sliding nicely, which is the “turbo” part of “Addi Turbo.” So far only one of the Knit Picks Nickel tips has started to show this tarnish, but I don’t use the larger needles that often and not for very long. I’ve heard that Skacel will refund your money or send you a new set if you contact them, but I haven’t tried it. It’s not too much of a problem, because I generally prefer wooden needles to metal anyway. I like the slight grip of the wood as well as the warmth and weight. I find wooden DPNs particularly much easier to use than aluminum ones. 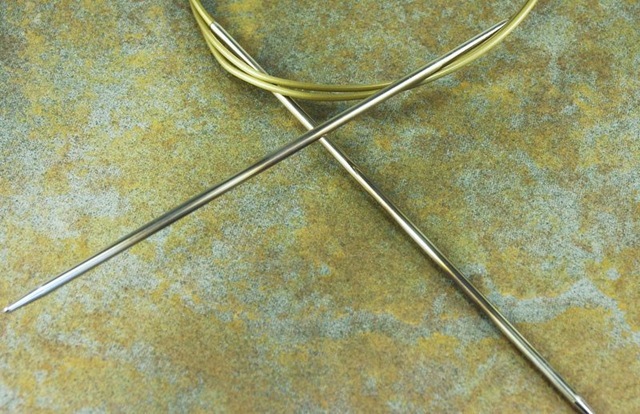 The only problem is that it’s hard to find a wooden needle with that nice sharp point that metal ones have. I especially hated knitting the Danube socks with the duller points. Really, any time I have to do a k2tog those dull tips are an issue. I had forgotten that Knit Picks made wooden needles until I was ordering the yarn for the Vest. I had kind of steered away from them because I really don’t like the multi-colored look. But I swallowed my aesthetics, ordered some, and I’m glad I did! Their Harmony wood needles are almost as sharp as their metal ones. I’m not sure how I feel about their cable for smaller needles and I think I’ll really miss the swivel action on my KAs, but I’m going to try to knit some lace socks with the Knit Picks needles and see how it goes. The top is Takumi/Clover, size 1; the middle is Knit Picks, size 1; and the bottom is KA, size 1. 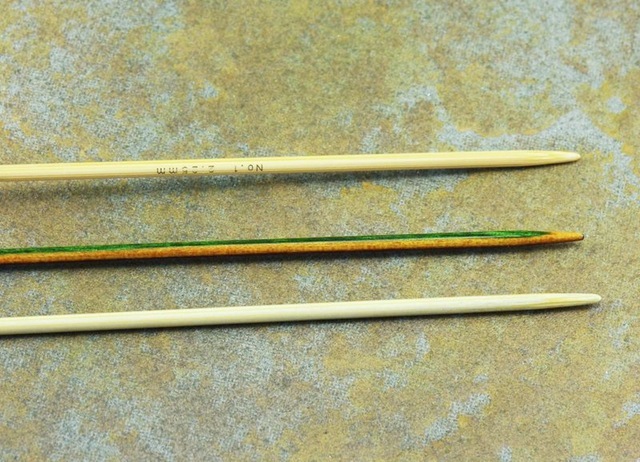 See the nice sharp point on the Knit Picks one? I’m excited. I’m pretty picky about my needles, so I’m sure you’ll hear much more about my search for the perfect needles. Probably more than you ever, ever wanted to know. I really like the diamond cables I substituted, but the rice stitch I used for the half-diamonds doesn’t really pop like I had hoped. I haven’t decided if I’m going to add a pom-pom on top, as is traditional. (I probably will.) The yarn on top there is the tail that has to be woven in. And here it is on my big head facing, of course, away from the light source. Really, I’m a special kind of stupid today. I think I’m going to run a few strands of elastic through the ribbing at the bottom. I’m not sure if it’s the grip of the yarn on itself or the provisional cast on (probably not) or the fact that the brim was knit on size 3 (!!) needles, but it’s not very stretchy. 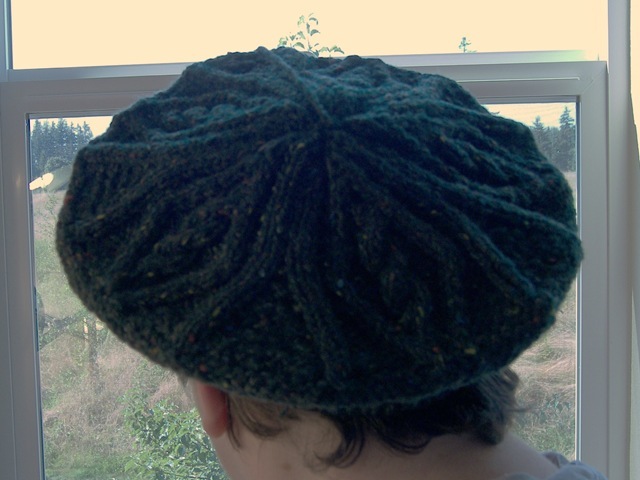 But other than that, I’m quite pleased with my first tam! Thank you again for the yarn, Norman! Looks just like the other tams, right? 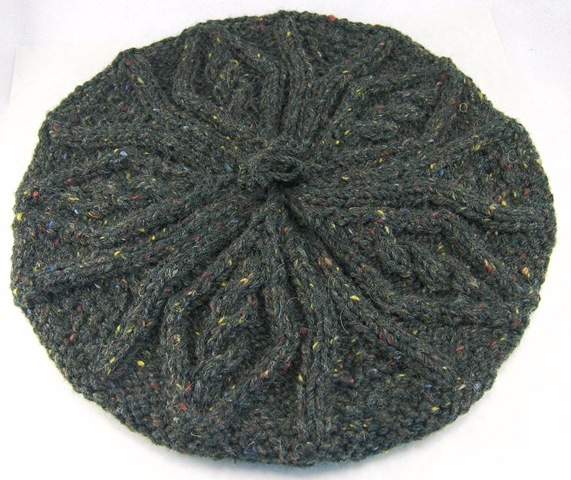 This is the Aran Tam from One-Skein Wonders. Isn’t that perfect? And then, fate struck. I looked at the yardage for the pattern. 350 yards. “Well, that’s great!” I thought, “that’s about how much I have.” Then, a glance at the suggested yarn…: Kerry Woollen Mills Aran Wool! I was practically floored by the coincidence. I promptly (by that I mean the next morning) rushed to the library and checked out One-Skein Wonders. That hat is going to be mine! (Well, I’ll probably end up changing it somehow… maybe sub a cable or two. It’s just how I work.) It’ll be just the right project to tide me over. Tide me over until what? Keep reading. I’ve abandoned my sock WIP (work-in-progress, for the non-knitters.) There’s nothing wrong with the yarn or the pattern. It was just perfect a week ago, but now working on it makes me want to throw the darn sock across the room. And it’s really not the sock’s fault. 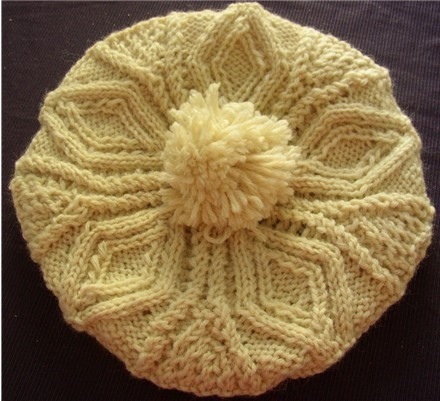 I’ve been suppressing my extreme desire to knit something else. And, as many of you know, once you’ve secretly given your heart to another project, nothing else will do until that new project is cast on. What’s the project that’s got me pining away, unable to work on my previously fabulous, beautiful silk/wool sock? 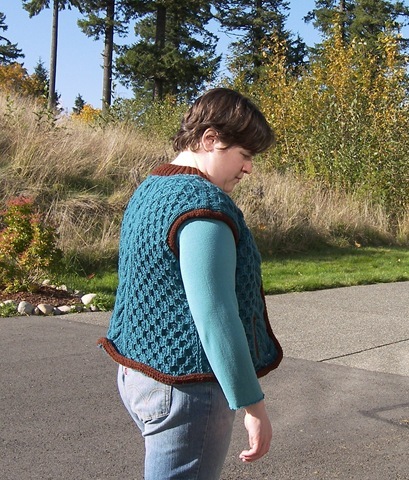 The Estes Vest from Interweave Knits Fall 2008. I don’t even know why I’m so in love with this. But I have to make it. Nothing else will do. I’ve read the pattern probably 10 times so far. It’s knit in bulky weight, which I don’t really use much (being a sock knitter and all.) I’m itching to knit something bigger than a sock. 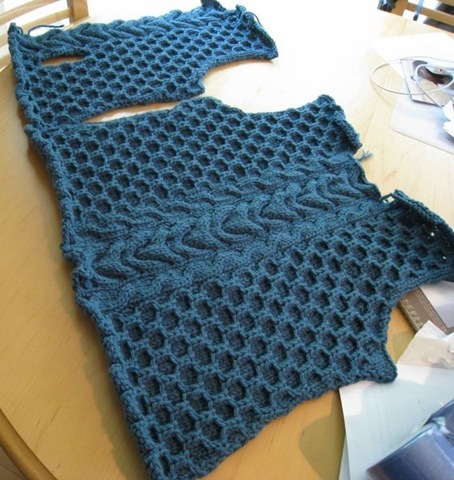 I really want to take the plunge into sweater knitting; the challenge of sleeves and necks and steeks intrigues me. I live for learning new things. The problem, though, is that I’m right in the middle of loosing some weight. (I know everyone say that, but trust me, this is happening.) 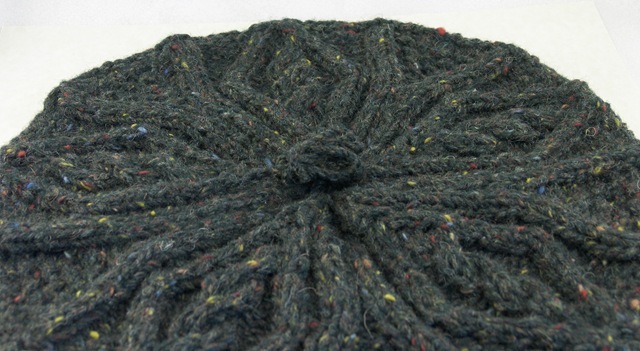 Why spend hours, days, weeks, knitting a sweater that will be too big by next year? So, I’ve very carefully squashed the knitting urges. But this vest… Vests can be a little big; they’re meant for layering. 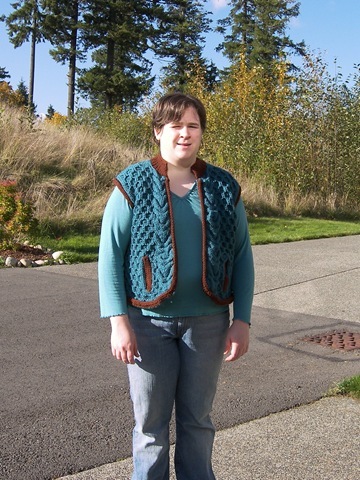 Vests aren’t quite as much of a commitment, especially if knit in bulky weight, what with the “no sleeves” thing. And look at the cute toggles! (Which I want to make out of polymer clay.) Let’s face it, the yarn is already in my cart in Knit Picks. Wool of the Andes Bulky, in either Scuba or Sky, I keep changing my mind, which is why I haven’t actually placed the order yet. But I think I’ll finally flip a coin and place the order in a few days. Must… make… vest…! But will make pretty hat until yarn arrives.